Booze is delightful, but sometimes a different sort of indulgence is what you need to unwind. Here, Vancouver’s best desserts. This old-fashioned café offers many tempting homemade treats. Our favourite: English sponge cake soaked in Grand Marnier, with vanilla custard and fresh local berries. 4160 Main St., 604-879-7933. No man should be seen eating a pink cupcake. Which is why you should head to the ’burbs to indulge in the girly – but oh-so-delicious – Ra-Ra Raspberry. 101-2636 Montrose Ave., Abbotsford, 604-852-1904; 15015 Marine Dr., 604-541-4668. 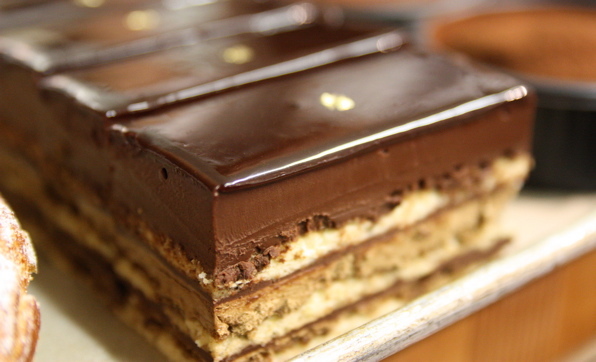 This Parisian patisserie makes an authentic Gâteau Opera that’ll have you singing songs of joy. The sweet boutique’s Opéra à la Noisette features dark chocolate ganache, coffee buttercream, hazelnut biscuit and praline crunch. 1262 Homer St., 604-899-1098. This country café is known for its fresh pies, which are made from ingredients from the owner’s organic farm in Fort Langley. The B.C. apple pie is a classic. 3594 West 4th Ave., 604-733-8308. Visit East Vancouver’s famous gelateria and sit down with Italian owner and local character Vince Misceo to design your own gelato cake. Misceo offers more than 500 flavours from grapefruit to garlic, so everything is possible. 1033 Venables St., 604-251-3211. Want a sweet buzz without feeling weighed down or guilty? Try some “orbs of cacao, coconut and endurance-giving maca root.” (The menu’s words, not ours.) 101 – 436 Richards St., 604-684-3663.